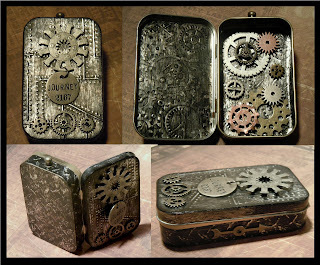 ﻿﻿﻿This is a steampunk designed mint tin made for a swap I am hosting on one of my yahoo groups; All Things Tim (Holtz). Once the signups closed and partner's were assigned, I was motivated to get started on mine right away. When I sat down at my art table, I didn't really have any design idea in my head. I figured I'd just look at all my Tim Holtz supplies and wait for something to speak to me. I happened to move something out of the way on the table I saw a piece of silver sticker paper that I had run through one of the TH texture fade embossing folders (Metals) and my mind exploded. Yes it got messy. I had been wanting to try a fake metal look technique and hadn't really attempted it. I figured I'd try it on this piece of embossed sticker and see what happened. "Holy mint tin batman!" The technique worked and a mint tin idea was born. This turned out way cooler than I even imagined. The technique briefly, was to paint black acrylic paint across the embossed sticker sheet (metal tape, metallic paper) then quickly rub it off with a paper towel. Which wipes off the paint from the raised areas and catches on the ridges. The result... a piece of distressed metal. I used 3 texture fade folders; both the riveted metal (top) and the splash guard design (bottom) from TH and then a gear collage design from Cuttlebug. It has a smaller image design than TIm's or Sizzix did so it worked better for the inside of the tin. Then I put it all togther, along with all the embellishments. Wow Jocelyn, the tin is gorgeous. I've never tried steampunk though I like the look. You've done a great job with this. You've inspired me to give it a go, and also to work more with my Cuttlebug. Your swap partner is going to swoon when they get this one! Thank you! I may have a hard time giving it up. I'm working on a gold/brassy looking one now... I may have to make something less cool so I'll give it away. Call me selfish ! I just couldn't part with this tin. Amazing job, I just love your creation. Now following your blog. That is so cool!!! I'm making 2 tins for the swap because I know I'll have a hard time giving it up, lol! So grungy and steampunky - i love it! Love the metal look you created on your mint tin!! I just made a frame with the same technique and am really happy with the way it turned out. Altered Tin for a swap.